Who doesn’t love Portal? It and its sequel are two of the highest-rated games ever. They aren’t just incredible first-person puzzle games (though they certainly are that). Portal encompasses an entire world and idea, that of a sadistic and sarcastic looming AI controlling a futuristic research facility. GLaDOS’s dark, dry humor and torturous testing protocols are usually what players immediately think of when Portal is mentioned–along with the iconic blue and orange portals, of course. Despite fans clamoring for more Portal, Valve seems particularly hesitant to milk the franchise. GLaDOS can’t be contained though. The passive-aggressive intelligence made an appearance in LEGO Dimensions a few years ago, and now Bridge Constructor features an opportunity for fans to get a little bit more time in the Aperture Science Enrichment Center under her tutelage. Marrying equal parts of each franchise, Bridge Constructor Portal sets the bar high as a crossover that feels less like fan service and more like an effective combination of each source property. The Portal aesthetic is palpable. Had I not known that Bridge Constructor was already a series, it would be easy to think that this was just a Portal spin-off. GLaDOS is voiced by Ellen McLain, the same actress who portrayed her in the Portal series. The Aperture testing chambers look like the sterile white environments that haunted Chell during her trials in the original games. 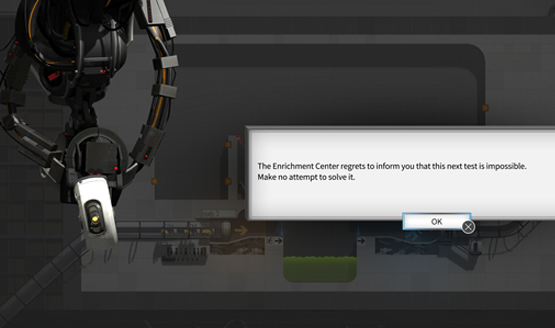 Bridge Constructor Portal’s humor centers on the dry sense that Aperture’s bottom line is more valued than human life. It never quite hits the same high notes that the writing in Portal and Portal 2 did, but hearing GLaDOS passively-aggressively insult my performance still brought a smile to my face. A side-scrolling, bridge-building puzzle game might be a departure from the first-person testing facilities that Portal fans are used to, but so are portals and bounce gel unfamiliar elements in the Bridge Constructor franchise. The basic idea is to construct physics-accurate bridges using cabling, struts, road segments, and predetermined anchor points in order to get testing vehicles from the beginning of the level to the end. Puzzles start out easy enough, teaching the basics of bridge building and reinforcement. Over time, additional elements are added that complicate the path to the goal, including the famed portals, companion cubes, and Portal’s deadly turrets. 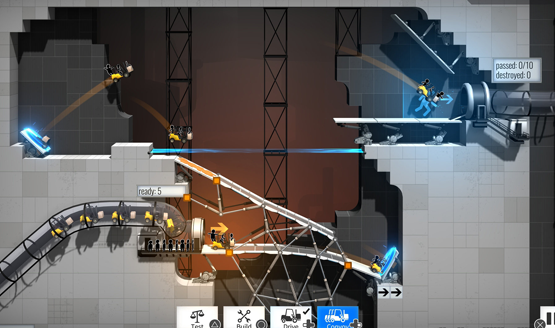 Unlike previous Bridge Constructor games, Bridge Constructor Portal doesn’t require resource management in constructing solutions to each puzzle. Budget is tracked, but is ultimately a meaningless number. I had unlimited funds to place as many struts and roadway segments as I wanted, almost ensuring that any level could be brute forced by over-building. Bridge Constructor lends its puzzle elements through simulating the physics of each thing I build, but those physics could often be overcome through flooding the screen with triangles. Is the roadway a little wobbly? Without budgetary or material restrictions, the answer was almost always more struts and more cables. It was disappointing knowing that there were probably more refined solutions while looking at a monstrosity of struts and cross-bars designed to hold up a few small pieces of road. Elegance is never challenged. Puzzles focus more intently on trajectory through portals and getting angles just right. This approach gets a little tired during the final third of the game as each subsequent level only looks for more complex ways to criss-cross portals and paths, as opposed to challenging simple design. As such, the hardest of Bridge Constructor Portal’s levels have a tedious cleverness to them. I was consistently captivated by the Portal puzzle elements as I lined up portal trajectories, but bored by the tedium of building endless struts without limitations folded into the puzzle design. Even if Bridge Constructor Portal doesn’t want to impose building restrictions, global leaderboards could help with challenging players to build more cheaply and elegantly. Currently the astronomical budget number at the top of the screen has little use outside of personal bragging rights. The trophy list doesn’t even introduce any budget limitations. Bridge Constructor Portal’s Platinum trophy can be obtained without ever worrying that you might be building too much. Solving puzzles using lumbering construction feels out of touch with Portal’s traditionally precise and tight puzzle solutions. Bridge Constructor usually has a variety of vehicle types that test a player’s bridge-building skills, but Bridge Constructor Portal sends a convoy of the same single vehicle along the roadway for the ultimate trial. It may be possible to get one testing vehicle through to the end, but attempting to get eight in a row to the finish may require some alterations. Most often the puzzles simply require bridges to be shored up for the convoys (another issue with unlimited resources not presenting much of a challenge), but occasionally there will be levels that require reworking pathways so that vehicles don’t collide as they warp from one side of the level to the other. Victory is sweet though (like cake). Figuring out the paths of vehicles, buttons, companion cubes, turrets, and every other puzzle element was just as gratifying as finally figuring out how to escape an Aperture testing facility. Finally lining up those trajectories to perfectly guide eight vehicles to the finish was triumphant as I overcame both physics and problem-solving. Even on levels where I brute forced my way to completion through over-building, it was satisfying to see each and every vehicle reach the end, to the pathetically celebratory sound of a single party horn. Bridge Constructor Portal leans heavily on its Portal collaboration, in some cases forgetting its Bridge Constructor roots. It’s a brilliant spin-off for anyone missing GLaDOS’s tests, even if the game’s unlimited building philosophy feels lumbering and brutish at times. I’m always happy to get a new perspective on a popular game world from a different developer. Bridge Constructor Portal is a great look at what Aperture might get up to outside of first-person physics puzzle-solving, showing that GLaDOS is definitely still alive. 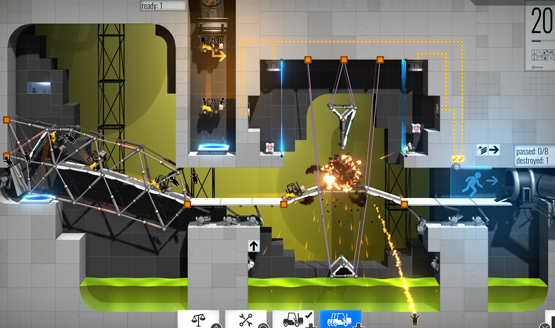 Bridge Constructor Portal review code provided by the publisher. Version 1.00 reviewed on a standard PS4. For more information on scoring, please read our Review Policy.